There is nothing that can enhance the beauty of your hands than a fresh coat of paint on your nails. However, a coat or two of one single nail polish is oh so passé. The nail paint trend has changed. It is now all about nail art ideas and designs. This has in fact taken the shape of a full-fledged profession. With Christmas round the corner, it is time you start thinking of how to dress up for the celebration. Actually, with the festivity in the air, you can start right now! 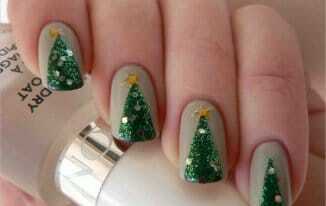 Why not add some Christmas nail art ideas and designs to your elegant nails. Previously we have shared 110+ cute nail design ideas for creative nail art designers. Here are some simple and cute nail designs that capture the Christmas mood. Take a look at our collection of 7 simple yet attractive Christmas nail art ideas for holidays. When you think of Christmas, you also think of the legend associated with it, that of the bright star that led the wise men to baby Jesus. No wonder, the festival is all about stars. So, why not give your nails a starry look for Christmas. Take red nail polish and paint two coats of it on your nails. Let it dry. Pick white nail polish and with a thin striper brush, draw a vertical line on one side of each nail. Now draw a horizontal line that intersects this line. Once these are dry, add in two diagonal lines that pass through the meeting point of the two lines. Now dip the striper brush in white nail polish and put in a sprinkling of dots on the remaining part of each nail. You now have a personal starry sky at your fingertips. Christmas is all about candies and candy cane. If you are a huge fan of these sweet wonders, then you can surely express your love for them in a fascinating way. Paint them on your nails. First things first, apply two coats of golden nail polish on your nails. Make sure this is the glittery kind as this surely looks more elegant. Use a striper brush to add a white line on the tip of each nail. Just below the line and a bit to the middle, put a white dot on the nail. Now join the line and the dot with a curve like the one customary to the candy cane. Once this dries up, use a red nail polish to paint in lines on the curve with the striper brush. Voila!! 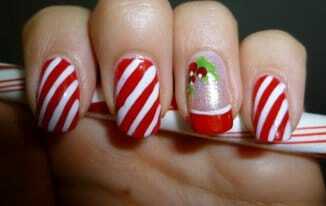 You now have candy canes on your nails. You just can’t wait to unravel those gifts that have been piled up under the Christmas tree. But as of now, you need to be patient and wait for the opportune time. As you do this, give your nails a gifted look. Put in two coats of your favorite bright nail polish. You can go for red, shocking pink or yellow. You can even use the muted shades of green, black or blue. Now take a striper brush and dip it in golden nail polish. This should not be the glittery kind. Paint a straight vertical line on each nail. Once this is dry, draw a horizontal line. On the nail of the middle finger, add in a bow like design. There you are with gifts on your fingertips. You decorate your Christmas tree with string lights to give it an ethereal appeal. Well, did you know that these lights can add to the charm of your nails too? Here’s how. Pick a hunter green shade and put on two coats of this nail polish. Go for a silver shade nail polish and dip in a striper brush in it. Draw a thin slivered, curvy line across each nail such that it looks like a string. Using nail glue, stick colored crystals to this line. Your string lights on nails are ready. In case you are thinking of adding some shimmer to your nails, but in a novel way, we have got a perfect and cute nail design. Pick a burgundy nail polish. Apply two coats of it on each nail. Once that dries, paint on a layer of transparent nail polish. Take some pink glitter and quickly sprinkle it on the nails. Make sure to do this quickly as once the top coat dries; the glitters will not stick. Now, wait for the top coat to dry off. Use a soft fan brush to remove the excess glitters from the nails. Whether you are celebrating a white Christmas or not, people the world over associate the festival with snow. So, get in some snowflakes on your fingers with this Christmassy nail art idea. For the base coat, use an iridescent nail polish. Take a thin striper brush, dip it in white nail polish and make three crisscrossing lines on the nails. Put in small Vs to design the end of the snowflakes. You can alter between big and small snowflakes for an interesting look. If you are short on time but still want some Christmassy touch for your nails, this is a quick and easy nail art design idea for you. First, take a green nail polish and put two coats of this one each nail. Then color the tip of each nail in gold. Once this dries up, put on a transparent top coat for that extra sheen on the nails. Also Read: How to Add Christmas Sound Effects and Santa Claus to Your WordPress Site to Greet Visitors? So, this Christmas, go ahead and paint your nails to reflect the festive mood with these easy and cute nail designs. 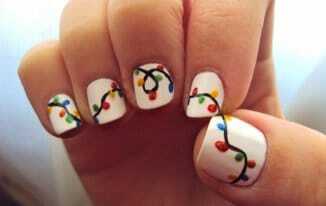 Hopefully, these cute Christmas nail art ideas and design will be helpful. Which of these Christmas nail art ideas you liked the most and why? Let us know in the comments.